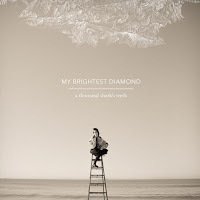 Atlas and the Anchor: My Brightest Diamond - "A Thousand Shark's Teeth"
My Brightest Diamond - "A Thousand Shark's Teeth"
Shara Worden and My Brightest Diamond will release their second album, "A Thousand Shark's Teeth" on June 17th, on Asthmatic Kitty Records. It is so refreshing when the sophomore release is just as good and/or improves on the debut. I would compare the sound of Shara's voice to Tori Amos channeling Jeff Buckley, and overall, the music sounds like a painting. There are so many carefully arranged layers of color with the unique instrumentation, all produced and arranged by Shara herself. New CD: The Kyle Sowashes - "Yeah Buddy!"